Ah the ubiquitous blue and red professional logo with the white figure. I did some research on this logo before. I think it started with the MLB, but I’m too lazy to even go back into my archives to check it out. Suffice to say it has some legs like 44 years later. Okay, wait. The dude’s name was Jerry Dior. Then the NBA did the same thing and now every video game, iconic movie, and soon everybody on earth will have their own Dior logo. 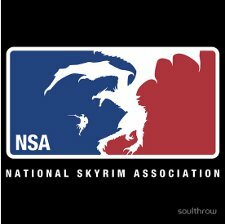 Before that happens you might want to get this National Skyrim Association T Shirt, so you can say you were into this stuff before everybody and their mama got involved. Soulthrow designed this one and has made it available on Red Bubble. Wait, I guess the other interesting thing about the Dior logo is that it’s always connected with the Association, which is in line with the NBA, but really it was Major League Baseball that started it all, so this shirt should be Major League Skyrim. The name it has actually has a better ring to it so I’m going to give him a pass.